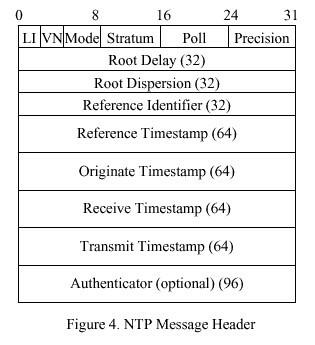 The format of the NTP Message data area, which immediately follows the UDP header, is shown in Figure 4. Following is a description of its fields. The values that can appear in this field range from zero to NTP.INFIN inclusive. Poll Interval: This is an eight-bit signed integer indicating the maximum interval between successive messages, in seconds to the nearest power of two. The values that can appear in this field range from NTP.MINPOLL to NTP.MAXPOLL inclusive. Precision: This is an eight-bit signed integer indicating the precision of the local clock, in seconds to the nearest power of two. Root Delay: This is a 32-bit signed fixed-point number indicating the total roundtrip delay to the primary reference source, in seconds with fraction point between bits 15 and 16. Note that this variable can take on both positive and negative values, depending on clock precision and skew. In the case of stratum 2 and greater (secondary reference) this is the four-octet Internet address of the primary reference host. Reference Timestamp: This is the local time at which the local clock was last set or corrected, in 64-bit timestamp format. Originate Timestamp: This is the local time at which the request departed the client host for the service host, in 64-bit timestamp format. Receive Timestamp: This is the local time at which the request arrived at the service host, in 64-bit timestamp format. Transmit Timestamp: This is the local time at which the reply departed the service host for the client host, in 64-bit timestamp format.